Confession: I own a lot of metallic nailpolishes which I rarely wear. Why? Because they're just so super shiny. But - I used to do this and kind of forgot about it till Kate mentioned it the other day. 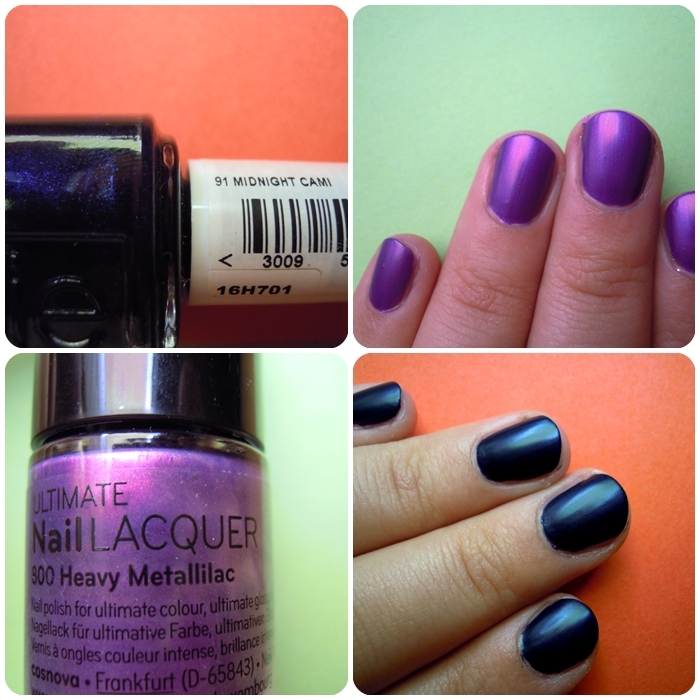 Why not pair up your favourite metallic nailpolish with a matte topcoat? This way you get to enjoy the lovely color without it being too shimmery/shiny. It's an interesting way to get a different look without buying a bunch of new polishes. I've done this with a glitter polish too, even though the difference isn't that strong. I used the Artdeco matte topcoat for these but I don't like it all that much. It somehow changes the color too much for my taste. Dark colors appear lighter and light colors end up with this shadow. Also, the polish is very thick and dries rather slowly. I *NEED* Heavy Metallilac in my stash! Hope I can get my hands on it in my next trip. Hast du die Neon-Kette von h&m gekauft??? Ich hab leider keine mehr bekommen! So ein Mist! Will die Kette auch unbedingt! Hehe das mit dem matten Finish ist echt irgendwie cool!